Kirtan is part of an ancient form of Yoga known as Bhakti, or the Yoga of Devotion. 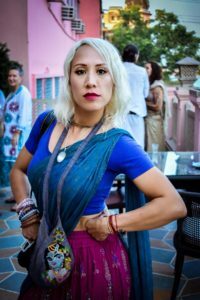 Erica Jung has been on the path of Bhakti Yoga since her initial journey to India in 2010 and returns multiple times yearly to lead groups and expand in her own devotional practice in connecting more deeply to the Divine. A former nurse turned yoga guide, spiritualist, and healing guide, Erica found the power of mantra and intentioned gatherings of sanghas to be incredibly powerful in our own and collective journeys to genuine bliss. For her, mantras have the power of bypassing the logical and intellectual mind and speak to something words struggle to describe. It's one of the most transformational gifts personally experienced and she shares these spaces, stories, and songs with a deep love and appreciation. Just bring yourself and an open mind and heart.